The Special Mission Offering for December is our annual “Thank You Offering” for Retired Ministers and Missionaries. This year the theme is The Grace of Giving. Through the simple act of giving, American Baptist Churches can share in an act of Grace that reminds ministers, missionaries, and widowed spouses who served so faithfully that they are remembered with love and gratitude. The offering supports those who have dedicated their lives to God’s service by providing emergency assistance in times of need, and a thank you check at the end of each year. It is hoped that RMMO can continued to serve as a joyous tradition for ABC congregations, and that you will be greatly enriched this season by The Grace of Giving. To date we have received $816 toward our goal is $850. To date we have received $681 toward our goal is $850. To date we have received $480 toward our goal is $850. To date we have received $190 toward our goal is $850. To date we have received $170 toward our goal is $850. The Retired Ministers and Missionaries Offering (RMMO) really began in the 1930s when American Baptist received a Communion Fellowship Offering on the first Sunday of each month to support retired ministers, missionaries, their widowed spouses, and the elderly clergy within their churches. In 1977, American Baptist Churches USA launched the RMMO to continue this tradition of expressing thankfulness. This year the theme is The Grace of Giving. Through the simple act of giving, American Baptist Churches can share in an act of Grace that reminds ministers, missionaries, and widowed spouses who served so faithfully that they are remembered with love and gratitude. The offering supports those who have dedicated their lives to God’s service by providing emergency assistance in times of need, and a thank you check at the end of each year. It is hoped that RMMO can continued to serve as a joyous tradition for ABC congregations, and that you will be greatly enriched this season by The Grace of Giving. 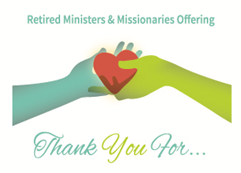 The special mission offering for December is our annual “Thank You” Offering for retired ministers and missionaries. This year’s theme is “Thank You for…” all the myriad ways in which these folk have served Christ’s church in every corner of the globe. We give in gratitude for the years of sacrificial service that many of these leaders have provided, often at very low levels of income. It is a way of saying “thank you” for the blessings they have brought to the church and our lives. We have received $704 toward our goal of $750.